Shooting fish in a barrel? For the deep-sea audio fisherman, 2014's 18th installment of the Warsaw Audio Show could easily conjure up that very unsportsmanlike image. That's because Poland's domestic hifi scene is surprisingly active, dense and advanced. Brands like Albedo, Amare Musica, Ancient Audio, Ansae, GigaWatt, Mytek, Pylon, sounddeco and Zontek either already are international players; or seem poised to become so shortly. 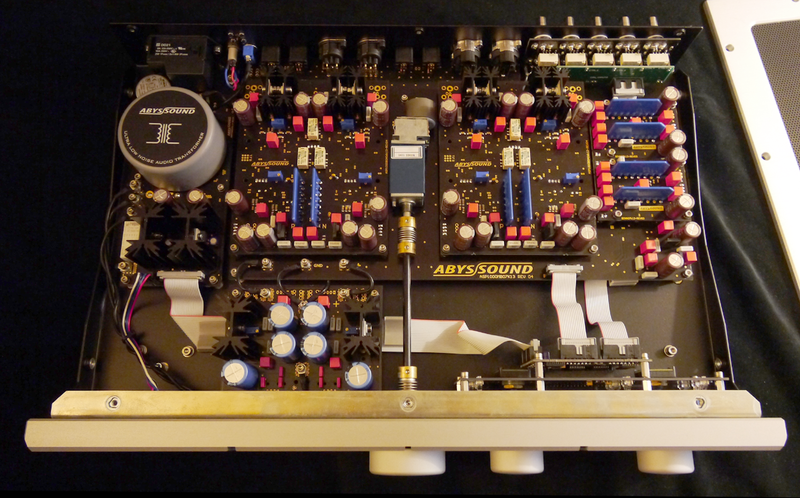 Squarely into the latter group fall AbysSound whose massive ASX-2000 80-watt pure class A flagship amplifier Marja & Henk had written up a few weeks prior to my show attendance. No doubt this company had the right stuff to compete on the global scene. Cosmetics, build quality and sonic focus were all suggestive of a Polish Pass Labs. 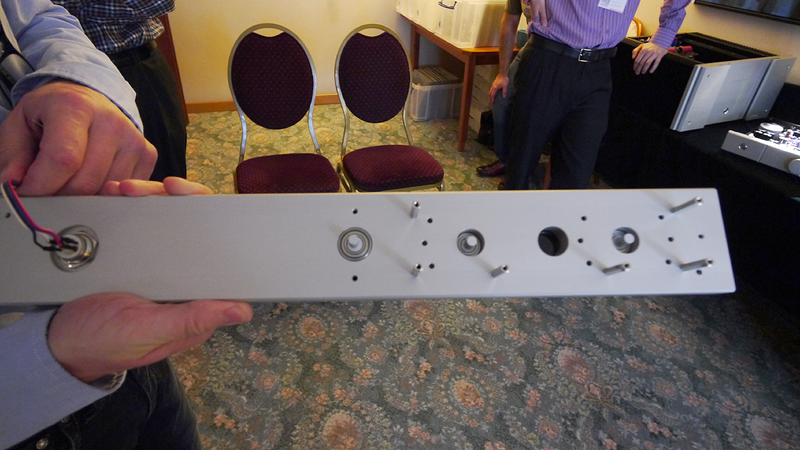 Their matching ASP-1000 preamp with its ball-bearing rotary controls wasn't just part of the active system. In gutted form it was also laid out on the display table to show off very tidy construction details. 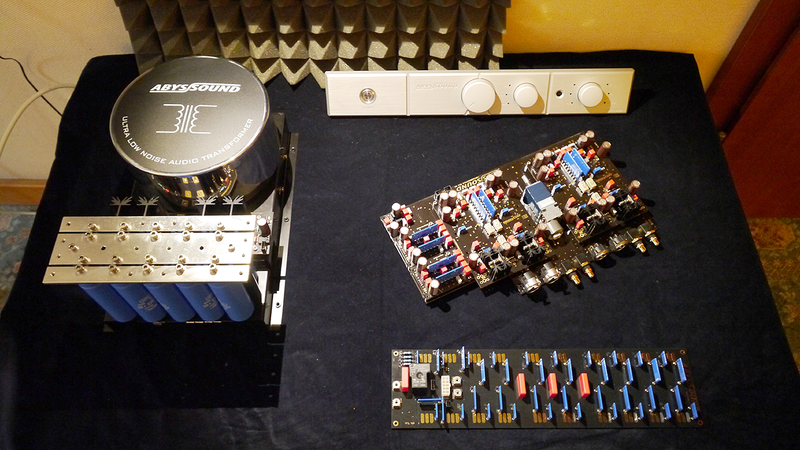 Plus, Warsaw had a prototype phono stage and integrated amp with DAC and phono modules to turn AbysSound into a compact but full product line. This demanded more coverage in our pages. Those ball bearings are easily visible in this shot. The central volume knob in fact gets one on each end of its bore to facilitate extra-smooth mechanical action. The ASP-1000 reference linestage looked like the perfect excuse to follow up on our ASX-2000 writeup. I asked the company's Piotr Siekanski to paint us the full picture to augment the next photo which I'd still taken at Warsaw's Sobieski Radisson Blue hotel. 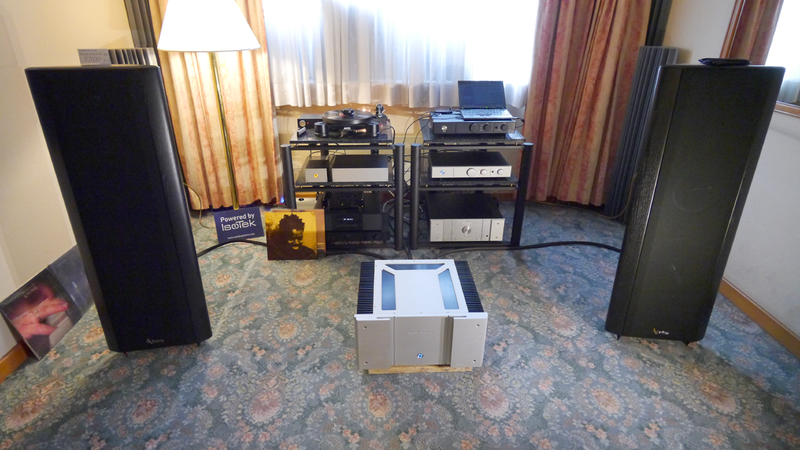 The color-matched blue vertical modules reminiscent of similarly sealed cards in Marantz, C.E.C. and B.M.C. circuits are for BJT-based voltage gain I remembered. Beyond that my show recollections were hazy. Time to let the designers fill in the gaps.